JCB chairman Lord Bamford and Loadall managing director Ian Pratt celebrating the 40th anniversary of the JCB Loadall with colleagues. 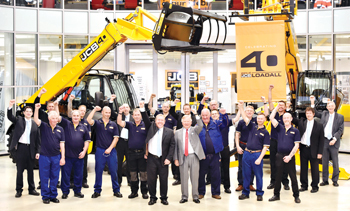 As JCB mark the 40th anniversary of Loadall production this year, the company’s exclusive distributor in Saudi Arabia, Abunayyan Trading Corporation (ATC)*, toured the UK production line to witness the manufacturing processes that make the telescopic handler the biggest selling model in the world. From the first Loadall in 1977, JCB built its 200,000th telehandler in 2016 and this year it celebrates four decades of this iconic machine. There are now more than 30 Loadall models, although the number of engine, transmission, boom and cab options results in over 1,000 machine configurations being built at the heart of JCB’s Rocester facility. Over 35,000 tonnes of steel a year goes into the construction of chassis, stabiliser legs and booms. Sheet steel is fed into two main production lines, one for booms and one for chassis, with a side production area for stabiliser legs. The steel is cut using computer-controlled laser and CNC plasma-cutting machines. A 650-tonne press is used to form the box section of the boom, which is tack welded with initial fitting of bushes, while chassis sides are drilled and tapped with all necessary holes. It takes 45 minutes to make two chassis sides, with a further seven to 12 minutes of drilling and tapping. All chassis and boom structures are tack welded by hand. Up to 70 per cent of the chassis and boom weld is then carried out by robotic welders, with manual operators completing the difficult-to-access welds. An incredible over 14.5 million m of welding wire is used in the Loadall facility annually. A twin-boring machine completes a final bore of the boom-mounting points to ensure that the two holes are perfectly aligned. Two £1.2-million ($1.58 million) computer-controlled machining centres drill, tap and finish the boom sections ready for assembly. Booms, chassis and stabilisers are all fed through a two-hour paint process, starting with a shot blast to remove contamination and prepare the steel for painting. All components are painted before assembly to ensure a high-quality finish. Finished components are baked at 90-120 deg C to provide a robust, protective covering for the machine. While yellow is the most popular colour, customers can also order Loadalls in their own livery. There are 300 staff in manufacturing and more than 460 work in the Loadall assembly. The sub-assembly sections sit on either side of the main assembly lines, preparing wiring harnesses, engines and transmissions, cabs and axle assemblies. These feed into the main lines as required, ensuring that production moves swiftly through the process. JCB axles are fitted with wheels and attached to the chassis. Hydraulic valve blocks, rams and cylinders from the hydraulic component division within the Rocester site go on next. Engines from JCB Power Systems are attached to transmissions from JCB Transmissions, with exhausts and other ancillaries added on the sub-assembly lines. There are around 3,000 components in a JCB Loadall and with up to 1,000 configurations, every build is strictly coordinated. With 35 build stages, it takes around eight hours to fully assemble a Loadall. Three inspection points ensure that every machine meets with JCB’s exacting quality standards. Every Loadall goes on to a rolling road and the engine and transmission are put through 13 minutes of speed tests, to calibrate the driveline. Once warmed through, the Loadalls enter a UVXPose booth that uses ultraviolet light to check the integrity of hydraulic componentry. An external test facility follows, where 10 operators carry intensive operational testing. This includes warm-up, steering tests and weight tests. Attachments that have been ordered are also installed and tested. The machines then enter a second UVXPose dark room for checking as part of an additional quality sign-off, before heading to the pre-delivery inspection centre. In August 2016, JCB opened the Loadall Customer Focus Centre. Every machine comes from pre-delivery inspection (PDI) to the CFC, where it is checked over again. The heart of the CFC is the Command Centre, which receives information from JCB’s LiveLink telematics system in every Loadall model. Data is also imported from JCB’s tech web service centre and from customer calls. A team collates all available information from Loadalls all over the world. If a concern is identified, the team initiates an enquiry into the cause and if it relates to manufacturing, this can be fed back to the factory speedily. The Command Centre then tracks the next wave of machines to be produced, to ensure quality is maintained to the highest standards. The system greatly improves the speed of feedback from the field, which would traditionally have taken weeks to get back to manufacturing. In Saudi Arabia, JCB has had a prominent market presence for more than 25 years. * ATC, a member of Abunayyan Holding Strategic Business Units (SBUs), sells and supports JCB backhoe loaders, compaction equipment, tracked excavators, telehandlers, skid-steer loaders and wheel loaders throughout the kingdom.